Although asthma can be effectively managed, many children and youth lack access to regular medical services and end up making unnecessary visits to the emergency room (ER). African American and Latino children visit the ER for asthma care more often than white children.3 These ER visits are difficult for families and costly for the health care system. In addition, asthma is a common cause of school absence: children with asthma miss 13 million days of school annually.4 These absences not only impact individual students’ academic achievement, but also overall school funding. This website has resources on best practices for asthma management, including a guide for schools. This toolkit was developed by the American Lung Association’s Asthma-Friendly Schools Initiative. It is a planning tool that helps community organizations collaborate with schools to create comprehensive asthma management systems. The toolkit can be used to ensure that children with asthma are healthy, in school, and ready to learn. This brochure, in English and Spanish, from the U.S. Environmental Protection Agency explains the dangers of secondhand smoke to children, especially those with asthma. (1) Bloom B, Jones LI, Freeman G. Summary health statistics for U.S. children: National Health Interview Survey, 2012. Vital and Health Statistics. Series 10, Data from the National Health Survey. Dec 2013(258):1-81. (2) Keet CA, McCormack MC, Pollack CE, Peng RD, McGowan E, Matsui EC. Neighborhood poverty, urban residence, race/ethnicity, and asthma: Rethinking the inner-city asthma epidemic. The Journal of Allergy and Clinical Immunology. Mar 2015;135(3):655-662. (3) Centers for Disease Control and Prevention. Asthma’s Impact on the Nation: Data from the CDC National Asthma Control Program. : National Center for Environmental Health;2012. (4) Akinbami L. The state of childhood asthma, United States, 1980-2005. Adv Data. Dec 12 2006(381):1-24. (5) Schelar, E., Lofink Love, H., Taylor, K., Schlitt, J., & Even, M. (2016). Trends and Opportunities for Investment in Student Health and Success: Findings from the 2013-2014 Census of School-Based Health Centers (SBHCs). Washington, D.C.: School-Based Health Alliance. (6) Webber MP, Carpiniello KE, Oruwariye T, Lo Y, Burton WB, Appel DK. Burden of asthma in inner-city elementary schoolchildren: do school-based health centers make a difference? Archives of Pediatrics and Adolescent Medicine. Feb 2003;157(2):125-129. (7) Mansour ME, Rose B, Toole K, Luzader CP, Atherton HD. Pursuing perfection: an asthma quality improvement initiative in school-based health centers with community partners. Public Health Reports. Nov-Dec 2008;123(6):717-730. (9) Guo JJ, Jang R, Keller KN, McCracken AL, Pan W, Cluxton RJ. 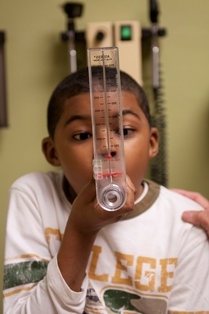 Impact of School-Based Health Centers on Children with Asthma. Journal of Adolescent Health. Oct 2005;37(4):266-274. (10) Lurie N, Bauer EJ, Brady C. Asthma Outcomes at an Inner-City School-Based Health Center. Journal of School Health. Jan 2001;71(1):9-16.